Marvel’s latest pre-avengers film hit cinemas recently. Was it all just a mindless action flick or does it also have a good plot? The movie takes place in three worlds; Asgard (Thor’s world), Jotunheim (a land populated by ice giants) and Earth (the place where you’re computer currently is). Thor (Chris Hemsworth) is banished to |Earth after he leads his friends into battle with the ice giants, thus breaking the peace. Thor lands on Earth only to be run over by scientist Jane Foster (Natalie Portman) and her research team. Knowing that she’s onto something, S.H.I.E.L.D agents confiscate Jane’s research. They also seal off the area around Thor’s hammer, Mjolnir, which you may remember from an after the credits scene of Iron Man 2. Back in Asgard Thor’s father Odin becomes sick and falls into a coma and Thor’s brother Loki (Tom Hiddleston) takes over, with a confusing plan that doesn’t make all that much sense. The graphics were great, especially the weather effects. There are plenty of explosions to satisfy action fans. I liked how a large amount of time was given to show how Thor got banished, but after the movie was over I couldn’t help but think that time could have been better spent. The actors were great. Natalie Portman and Chris Hemsworth were excellently cast and the two have so much chemistry together. Ultimately, the audience is left dissatisfied at the end. I went with two other people and they both agreed that the end was disappointing. This disappointment was increased when I told them the news that Portman would not be appearing in The Avengers movie. The movie differs from the original comic series. Portman’s character, Jane Foster, has been given a modernised role. In the comics she is a nurse, which made sense because Thor was trapped in the body or a doctor named Donald Blake. In the movie Thor gets to keep his own identity when he arrives on Earth. I think this decision really paid off as much of the humour comes from his lack of knowledge of Earth customs. The name Donald Blake is actually used in the movie briefly so keep an ear out. While the ending wasn’t exactly fulfilling, the rest of the journey was exciting and full of action. Some of the plot was hard to follow; it kind of felt like it was rushed or just not thought through enough. 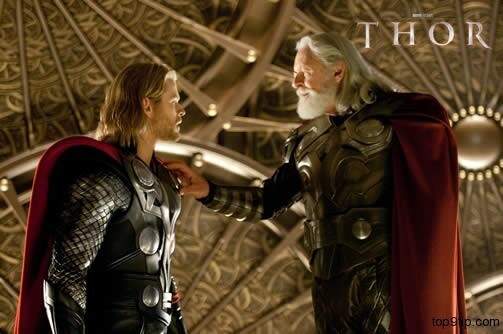 The actors have been signed on to reprise their roles in two more Thor films, which will hopefully be made. I’m not entirely sure how the ending will fight in with the Avengers film, but if they can find a way to bring Captain America into it, despite that fact that he should be an old man in the time period the movie is based in, I’m sure they’ll fit Thor in too. Just a note, there is a scene after the credits, I missed it and if you do too you can read about it online. What do you think? Do you like the changes they’ve made to the plot? Did you like the ending? Let me know by voting and leaving a comment below. This entry was posted on May 5, 2011 by adamodwyer1. It was filed under Superhero and was tagged with 2, action, after, agent, agents, america, asgard, avengers, blake, book, books, brother, captain, chris, comic, comics, credits, disappointing, docti=or, donald, earth, ending, father, film, films, foster, giants, hammer, hemsworth, hiddleston, his, ice, identity, iron, is, jane, jotunheim, loki, makes, man, movie, movies, natalie, no, nurse, odin, of, original, peace, picture, pictures, plan, plot, portman, poster, posters, premise, preview, review, s.h.i.e.l.d., scene, scientist, secret, sense, sequel, sequels, shield, spoilers, story, suerheroes, superhero, the, thor, tom, trailer, trailers, two, war, what, who, with.